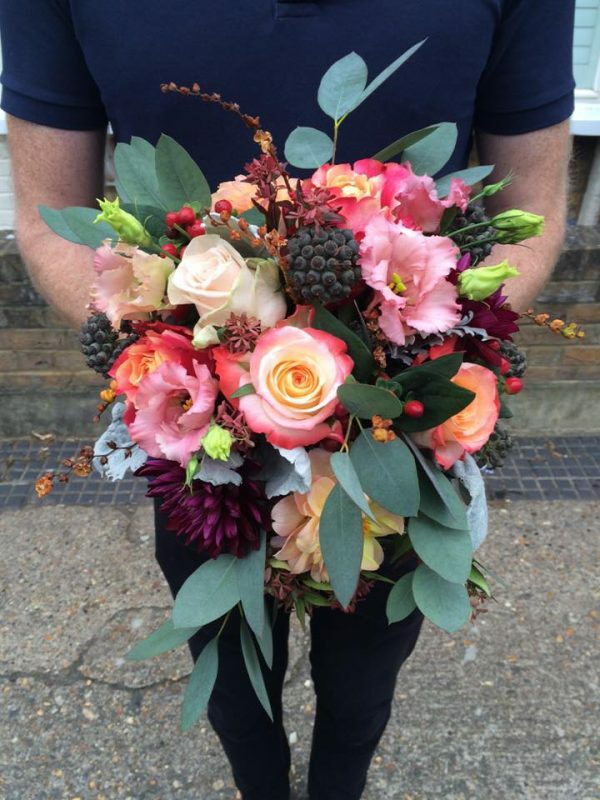 Autumn is our favourite season for wedding flowers. There are often days in September and October where the weather is good and the backdrop of autumn coloured leaves in the trees make for some stunning wedding photos. 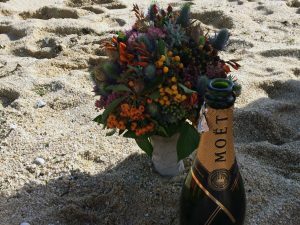 There are certain flowers that are at their absolute best in autumn and are great in wedding bouquets. The first one to mention is the Dahlia. This flower originates from South America and was originally grown for its tuber as a food source. The Dahlia comes in a range of colours from the giant blush Cafe-au-Lait and other whites,creams and pastels to bright oranges and pinks and purples to deep maroons like Nights-of Arabia. The Dahlia is available from the end of July with their peak season in September. 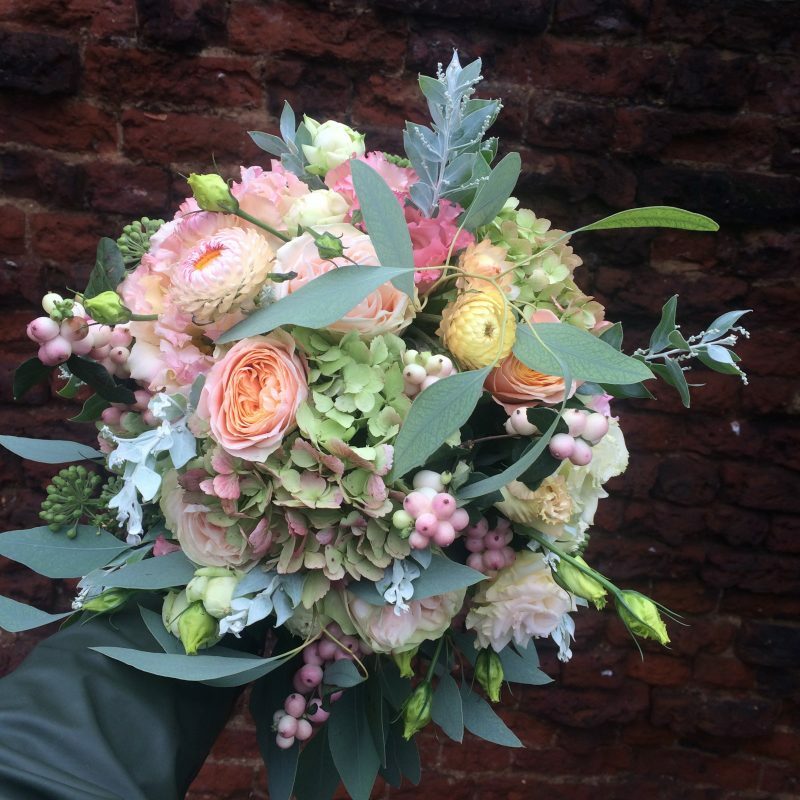 This wedding bouquet is an autumnal blush and white one. It’s a combination of roses and lysianthis, which are available year round, with Dahlia Cafe-au Lait, hydrangea and lots of silvery foliage. The olive branches are available in the autumn with little olives attached. 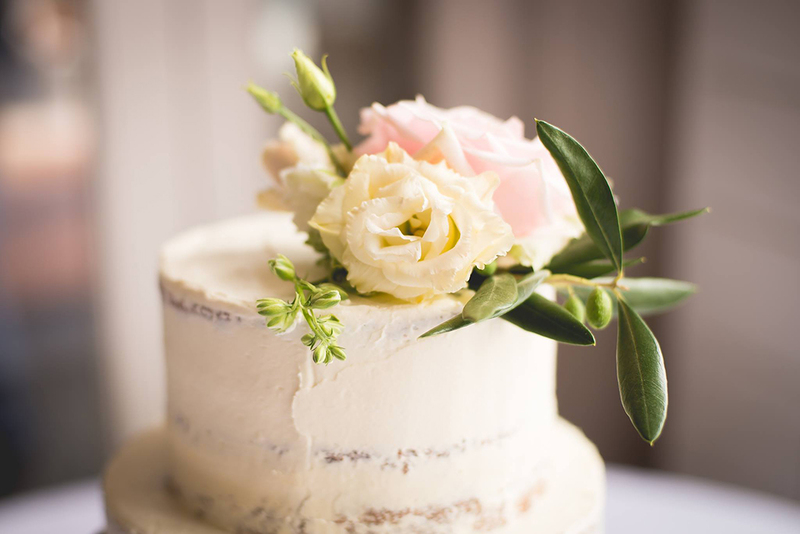 The next flower that’s great in autumnal wedding flowers is a two-tone rose. These aren’t neccerarily seasonal and available all year round but work so well in autumn wedding flowers. Some of my favourite are Cabaret, a cream rose with a peach tip and Cherry Brandy, a burned orange rose where the outside of the petal has a pink hue. A paler version with a muted salmon colour is a 3D rose. 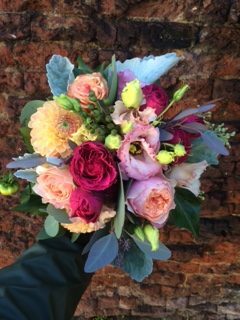 Here is an autumnal wedding bouquet with Cabaret roses and 3D roses. This one also has Dahlias. Lysianthus and Hypericum and Ivy berries in the bouquet. The next flower that is at their best in Autumn is the English Hydrangea. With lots of tones from pale green and white to soft pinks, blues and purples to bright pinks and maroons. The English Hydrangea is a great filler and great value for money compared to the Dutch greenhouse Hydrangeas. The coulors are more muted and a bit more dirty than the bright Dutch ones but they give a great vintagy feel to your wedding flowers and are great value for money. Below is a blush wedding bouquet with English Hydrangea. (If you are reading this and don’t live in England please read an outdoor grown Hydrangea). There are also some snow berries in there that is a great autumn filler and some Helichrysum or straw flower. These everlasting flowers are making a huge comeback and are a great way to give some texture to your wedding flowers. They come in a range of colours from blush and pale pastels to deep reds and burned oranges. A great colour palette for autumn are the Sunset tones. I am talking about reds, pinks, oranges and peaches and maroons mirroring an amazing sunset/ dawn or the turning of the leaves at this time of year. These colours are widely available and look great in autumn weddings. You can also add some blues and deep purples to the mix if you are brave enough or a pop of bright orange or red, it’s all good! Examples of great sunset tone flowers are Love pearl, Pink Lace and Esparance Roses, Salmon Dahlia, English Hydrangea, Hypericum, Ivy and Pyracanthus Berries and lots of dark foliage such as Cortinus, Jasmine, Amaranthus and Virginia creeper. 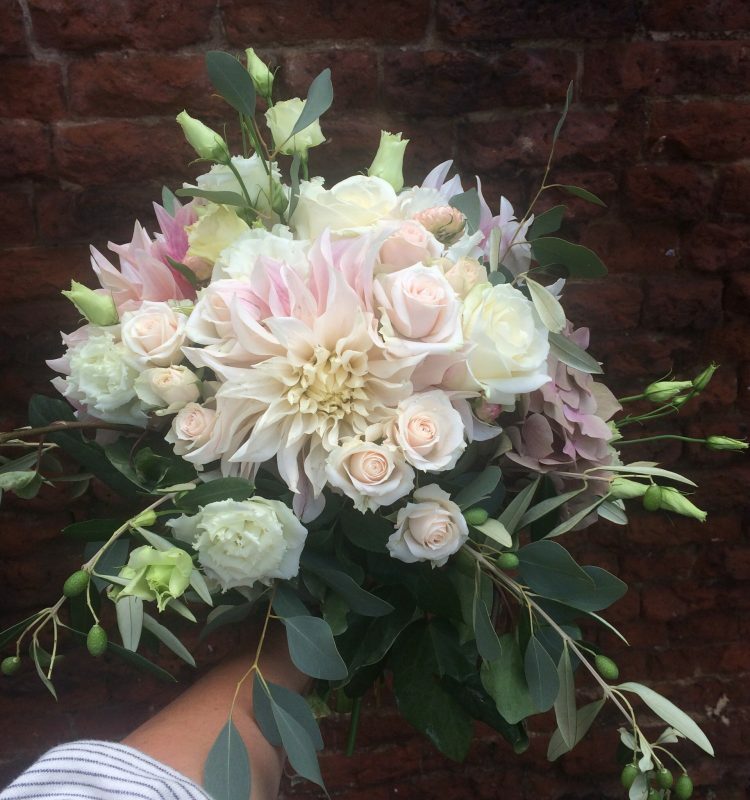 This bridal bouquet has some hot pink spray roses, peach Dahlias and Vuvuzela Roses with pink and peach Lysianthus and Senecio and Eucalyptus leaves. The bride wantyed the silvery foliage but it would also look really good with dark foliage such as Cortinus or hard jasmine thats has a deep red hue at this time of year. 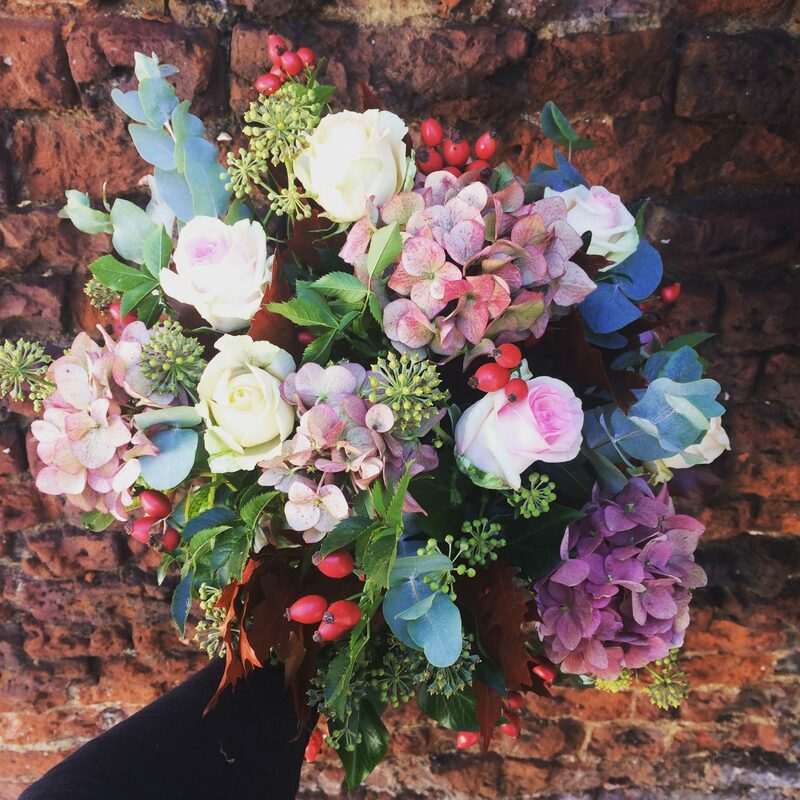 This wedding bouquet is an autumnal mix of berries, seedpods, thistles, sedum and crocosmia. The bride wasn’t too keen on flowery flowers and autumn is the perfect time for structural bouquets like this. Inspiration v Budget, what to expect from a wedding florist.